Last updated by Shari Harley at February 1, 2019 . Chances are, at some point in your career, you’ve worked with someone you wished would go away. Maybe the person repeatedly threw you under the bus, took credit for your work, or didn’t keep his commitments. And at some point, you wrote the person off, and have been merely tolerating him ever since. 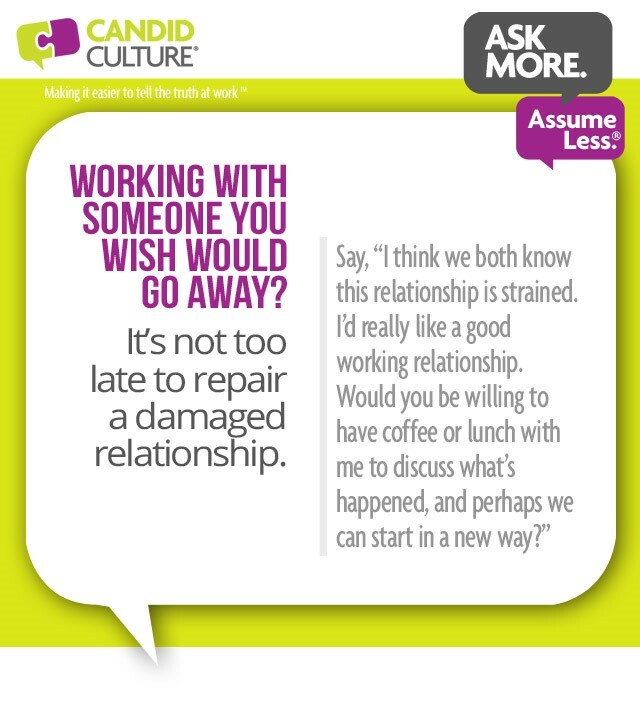 Damaged relationships can be repaired, if you’re willing to do some work. The first step in repairing a damaged relationship is to decide that you really want to do so. Managing conflict in the workplace isn’t easy. It will take effort and will likely be uncomfortable. So before you take action, decide if you really want to work on the relationship. How to know if you should even try resolving conflict in the workplace: Ask yourself how much you need the relationship. This probably sounds political, and it is. If you work on projects together, need to give or receive information, or have to work together regularly, then it’s likely worth working on the relationship. If you don’t need to work together regularly, then perhaps don’t work on the relationship. If you decide to attempt to strengthen a relationship, plan what you’re going to say. Never trust the first thing that comes out of your mouth during a difficult conversation. Step one for resolving conflict in the workplace: Like any feedback conversation, start with the end in mind. Consider what you want to have happen as a result of the conversation. Step two for resolving conflict in the workplace: Plan what you’re going to say by taking notes and practicing out loud. What you say in your head is usually not what comes out of your mouth. Step three for resolving conflict in the workplace: Ask the person for time on his calendar. People don’t like surprises. You’ll have a better outcome if the person has blocked time to talk with you. Have the conversation in-person whenever possible. If you can’t speak in-person, talk on the phone. Do not attempt to fix your relationship via email. 1. Email is wimpy. 2. It will not work. Step four for resolving conflict in the workplace: Ask for a meeting to work on the relationship up to three times. If, after the third time, the person hasn’t made time, stop asking. You can’t work with someone who won’t work with you. If the person doesn’t make time to meet, be polite, professional, and inclusive, but stop trying to nurture the relationship. Inclusive means: cc’ing him on necessary emails, inviting him to appropriate meetings, and providing necessary data. Step five for resolving conflict in the workplace: If the person makes time to meet, speak candidly, be yourself, and be vulnerable. I don’t mean set yourself up to be killed. I do mean be authentic. Tell the person what you want. Ask for feedback about how you’ve damaged the relationship. Listen to what you hear, and resist the urge to defend yourself. Ask for permission to tell him how he’s damaged the relationship. Give small amounts of feedback, with a few specific examples. Make agreements of what each of you will do differently in the future. Thank the person for the conversation and schedule another meeting. Step six for resolving conflict in the workplace: Build in follow-up. Most people have one conversation and expect things to be fixed, forever. Relationships don’t work that way. Agree to meet monthly, for the first few months, until you’ve rebuilt trust and learned how to communicate and work together. During the monthly meetings, give each other permission to give candid feedback about how you’re working together. I call these Relationship Inventory Meetings™. What’s working about how we work together? What working agreements did we keep? What working agreements did we break? Which working agreements are helpful? What working agreements need to change? If the nature of your relationship is impacting your ability to do your job, your professional reputation, or your happiness, all of those consequences are far worse and more long-lasting than any conversation will be. The conversations won’t be as bad as you think. No one will tell you anything you can’t handle, because for the most part, they’re afraid of your reaction and they know they’ll be next. Conflict in the workplace and damaged relationships keep people up at night, reduce job satisfaction, and often motivate people to leave jobs. If you’re experiencing any of these things, all of them are worse than any conversation will be. The anticipation of the conversation is far worse than the conversation itself. Decide if you want to strengthen the relationship. Ask for time to meet. Have the conversation. Speak honestly, but responsibly. Plan to have another conversation before ending this conversation. Congratulate yourself for being courageous and picking happiness over anxiety and frustration. Suffering is optional. As crazy as it sounds, your manager is afraid of you – afraid of your defensive reaction to feedback. All of us have been passed over for an opportunity at work – a promotion, raise, project, etc. – and for the most part, we have no idea why, because no one wants to risk our defensive response to tell us. This lack of knowledge makes it hard to manage your career. And to be frank, defensive people are extraordinarily difficult to work with. Having to watch every word, walk on egg shells, and be choosy about what to address and what to avoid is exhausting. Be receptive and thus easier to work with. 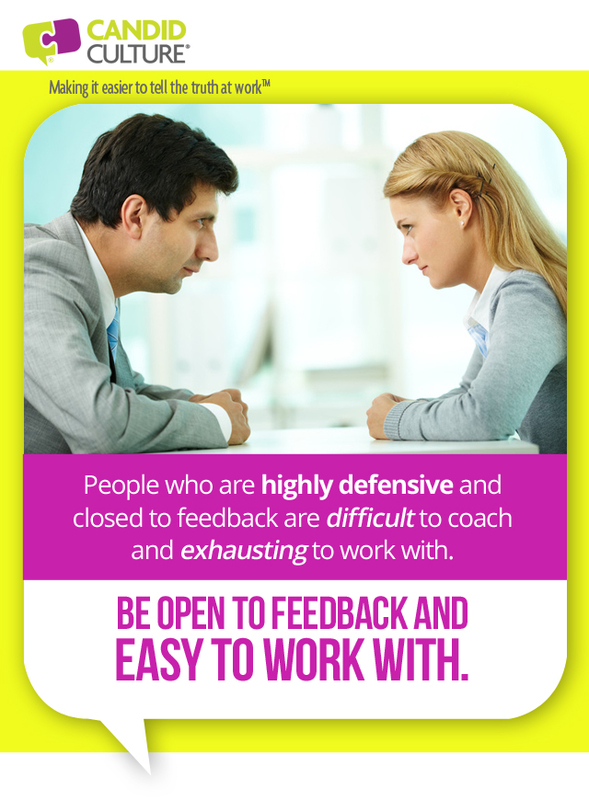 I teach managers to screen out candidates who aren’t coachable and receptive to feedback. Work is hard enough without hiring people who aren’t coachable. Being open to feedback makes you easier to work with. Tip three to be open to feedback and increase receptiveness: Come from a place of curiosity when seeking feedback versus thinking “there’s something wrong here” and “I’m bad.” Be curious about how you impact others and the impression you make. Seek feedback to understand both. People often hoard feedback until a situation becomes so frustrating that they can’t help but speak up. And because they waited too long to say what they think, many more words come tumbling out than is either necessary or helpful. When it comes to giving feedback, less is more. Be specific, give an example or two, and stop talking. If you want people to be receptive to your feedback, make it easier to hear by saying less. By saying less, I don’t mean don’t tell the truth or provide enough information that the person knows precisely what to do differently. I do mean, don’t provide more information than is necessary. You are likely familiar with the phrase “let someone save face.” Allowing someone to save face requires saying just enough that the person knows what to do differently, but not so much that the person feels attacked. Too much feedback: Last week you turned in a report that had five typos and had important pieces of information missing. I’m surprised you’d be so careless. It made our entire department look bad. I’m perplexed that you’d submit work without checking it first. What is leading you not to check your work and submit incomplete reports? Don’t repeat feedback. Say it once and move on. And remove unnecessary judgments (careless) and share just the facts. Just the right amount of feedback: The report you gave me last week had a few typos and was missing some important information. The report went to the client with those errors which didn’t reflect well on our department. What happened? Too much feedback: I noticed you didn’t speak up during last week’s department meeting. People won’t know the value you provide if you don’t share what you’re working on. You need to be more vocal. People’s only exposure to you is often during our team meetings. If you don’t speak up, you won’t establish yourself as a leader in your department. People really need to know what you’re working on and the impact you’re making. Too much feedback sounds like nagging. Most people don’t want to work with their parents. Just the right amount of feedback: I noticed you didn’t speak during last week’s department meeting. Often, team members’ only exposure to you is during our weekly meetings. How can I help you feel comfortable speaking up so you can establish yourself as a leader in the department? It’s easy to get carried away when giving feedback. We’re likely frustrated. And when our emotions run the show, it’s easy to say too much. Practice the 24-hour guideline and the one-week-rule. If you’re upset, wait 24-hours to give feedback, but not longer than a week after an event. Plan what you’re going to say both in writing and out loud. Practicing a conversation in your head is not the same as speaking it. Let someone you trust hear what you’re planning to say and ask that person how you can improve the feedback. Ask what you can remove without losing any of the message. Planning a conversation is like packing for a trip. When packing for a trip, many people put their clothes on the bed, then put the clothing in a suitcase. Realizing they have way more than they need, they start taking things out of the suitcase. Eventually they arrive at their destination with much less than they initially packed, but still more than they need. Use the same principles when planning a feedback conversation. Put every thought you have on paper, and then remove what you don’t need, leaving only the necessary points that tell the person just what he needs to do differently. When giving feedback, less is more. Tell the person what happened, why it’s a problem, and what she needs to do differently. Then stop talking and let her save face. As someone who writes and teaches about effective communication in the workplace, the people I work and socialize with are expecting me to model good communication skills all the time. The good news: I try really hard to always do the right thing and impact people positively. The bad news, I’m human and sometimes I don’t get it right. One of the things I’m proud of about Candid Culture, is that we are real people, working with real people. We work very hard to prac tice effective communication in the workplace and to always model what we’re teaching. And yet, like all people, we get busy, rushed, and tired. We read emails we intend to reply to, but then forget to do so. We occasionally send emails, when we should pick up the phone. In my world, a good communicator is not someone who always communicates perfectly. Cares about people and consistently works to communicate in the way others need. Asks for and is open to feedback about how s/he impacts people. Listens and watches other people’s verbal and non-verbal communication. Alters his/her communication style to meet other people’s needs. Takes responsibility when things don’t go well. This week I’m advocating for picking up the phone, even when you want to do everything but, being patient, even when you’re frustrated, and asking questions, versus accusing. And I’m going to admit, I’m working to do these things too. Sometimes I get it right, and sometimes I don’t. I’m in the trenches with you, working to say and do the right things every day. Only call people when you have adequate time, attention, and patience to have whatever conversation needs to be had. If you need a few days to return a call, say so. Let the person know when you’ll call. Prepare for conversations. Plan what you’re going to say and how you’re going to say it. Don’t have hard conversations when you’re frustrated, tired, or busy. They won’t go well. If the conversation goes poorly, call back later and clean it up. Being a good communicator doesn’t mean being perfect. It means caring enough to notice when you miss the mark, cleaning up your messes, and working to do it better next time. I’ll be working on the above recommendations too this week. And when I screw it up, you can be assured that my mistakes will become examples in our training programs of what not to do, followed by a new technique that will hopefully work for all of us. Unless you never interact with other people, there’s probably someone in your life who repeatedly engages in a behavior that annoys you. You’ve probably made requests about what you’d like to the person to do differently, and hopefully you’ve given feedback. But the behavior hasn’t changed. Working with difficult people strategy one: Become very clear on the behavior(s) you expect. Working with difficult people strategy four: If you’ve made a request at least three times, give feedback as to what isn’t happening and why that causes challenges. For example, “We’ve talked about inviting me to client meetings a few times. It’s still not happening. I’m getting calls from clients with questions I can’t answer because I’m not included in the meetings. Can you help me understand why I’m not being invited to meetings?” Read chapters nine through eleven and chapter thirteen of How to Say Anything to Anyone to get more examples of how to give clear and specific feedback. Working with difficult people strategy five: Know when to give up and accept the person and behavior as they are. 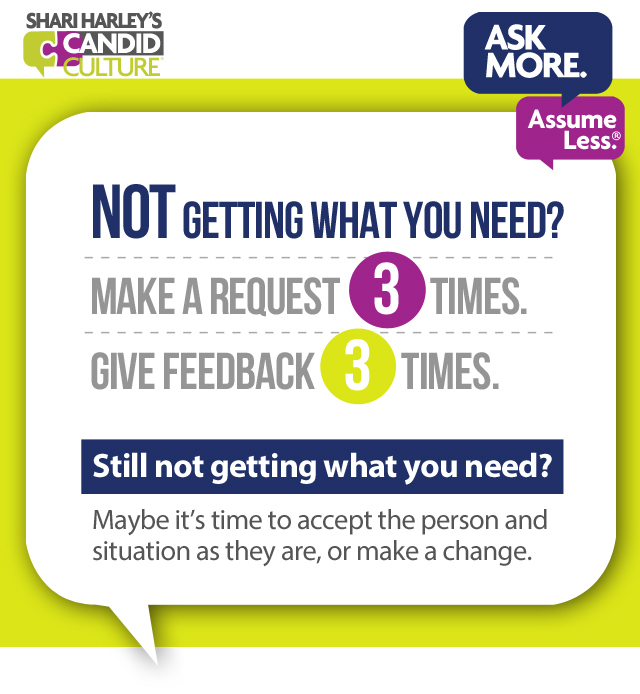 If you’ve made a request and have given feedback three times, you likely aren’t going to get what you want. The person either can’t do what you’re asking or doesn’t want to. Now you have a decision to make. Decide how important this behavior is. Is it a deal breaker? If it’s a deal breaker, you can’t work or live with the person. If it’s not a deal breaker stop expecting the behavior to happen and accept that it won’t. When you accept that you won’t get what you want from someone you’ll suffer less. Strategy five is really the crux of this blog. Knowing when to stop expecting something and coming to peace with that decision will give you great freedom. In order to let go of the expectation you have to decide that it’s really ok for you not to get what you want. Ask yourself, “Can I live with this behavior as it is?” If you can’t, you have a hard decision to make. If you can, then stop expecting and asking for the behavior. Truly let it go. You’ll feel better. The normal reaction to feedback is to get upset. The problem is, no one wants to deal with our upset. It makes them uncomfortable. So managers and peers alike start to pick and choose what to tell us. Not wanting to deal with our reaction, they start to pick their battles. The more defensive we are, the less feedback we get. The less feedback we get, the less information about our performance we have. The less information we have about our performance, the less control we have over our career. One of the things I’m proud of about Candid Culture, is that we are real people, working with real people. We work very hard to practice effective communication in the workplace and to always model what we’re teaching. And yet, like all people, we get busy, rushed, and tired. We read emails we intend to reply to, but then forget to do so. We occasionally send emails, when we should pick up the phone. Giving Feedback Requires Trust. No Trust. No Feedback. When I led leadership development training for a large mutual fund company we offered a lot of training focused on helping people have hard conversations. Over time I realized that despite that I’d bought and offered the best training programs I could find, the training wasn’t helping. Managers didn’t give enough feedback and when they did give feedback, employees were often left confused, wondering what they needed to do differently. I decided that what was missing was the conversation before the crucial conversation. It wasn’t that managers didn’t know what they wanted to say, many managers felt they couldn’t say what they wanted to say. There wasn’t sufficient safety or permission for giving feedback, so managers said little or delivered messages that were so vague, employees were left wondering if there was a problem. This is when the idea for Candid Culture was born. Think about the people – personal and professional – who can say anything to you. These are the people who can tell you that the person you’re dating is wrong for you, that a piece of clothing is not flattering, that you disappointed them, or dropped the ball. You may not enjoy getting the feedback, but you’re able to hear what they have to say and take it in, because you know they care about you and have your best interests at heart. You trust their motives. When you trust people’s motives, they can say anything to you. When you don’t trust people’s motives, there is little they can say. Get to know people better than you know them now. 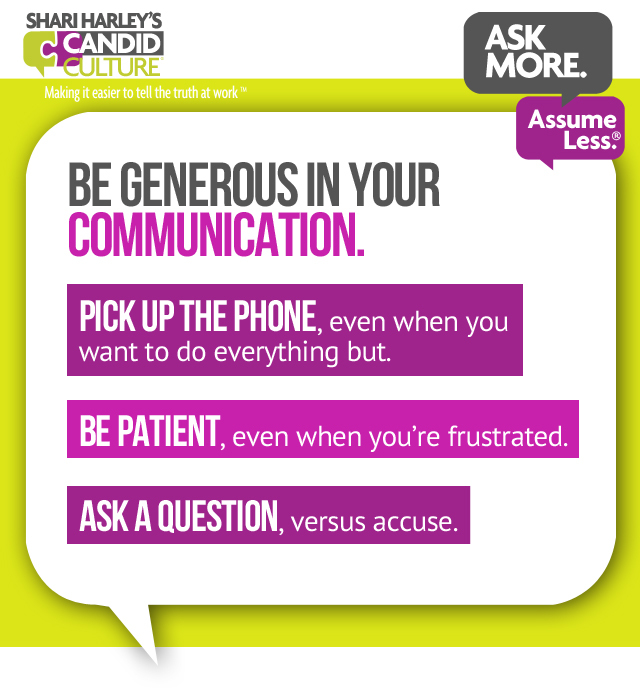 Download free conversation-starting Candor Questions to have these conversations. Worry less about giving feedback –for now. 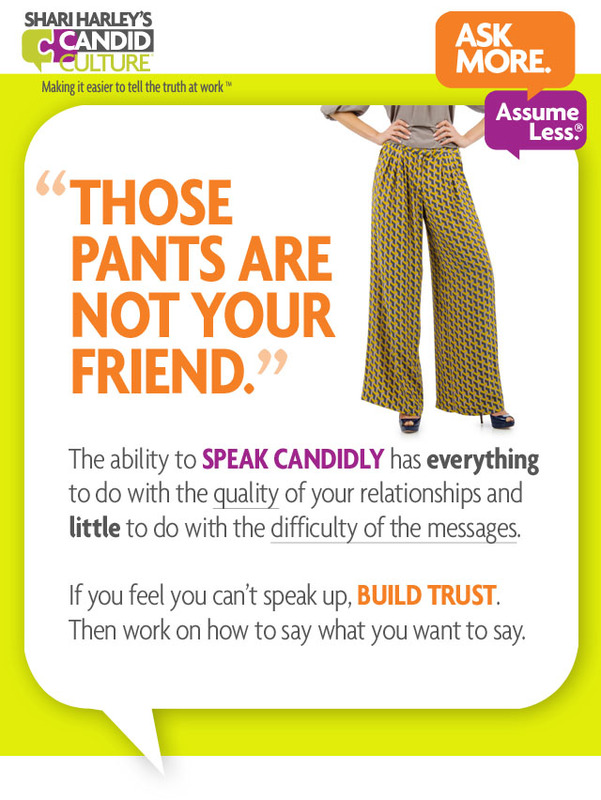 Instead, build trust. Get to know people better, then work on giving feedback.